Knowledge Base :: How to Process and Polish Baltic Amber - Amber Jewelry Store | Online Gateway to Amber Necklaces, Bracelets, Prayer Beads, Baby Teething Necklaces, Pendants, Amber Stones with Insects and Amber Earrings. There are various ways to process and polish Baltic amber, such as cutting, carving, filling, sanding, drilling, sawing or scraping it, but if you are new to amber crafting, then you should first start with rough chunks before moving on to valuable amber pieces. Amber stones are alive, so working with them requires passion, feeling and dedication in order to generate great results. And remember that crafting goes both ways: you work with the material and the material works with you. So let's see how to process Baltic Amber. Take for example how sawing is done. First off, you must mount a diamond-tipped saw, preferably circular, on a small bench motor. Hold the piece and feed it gently and firmly into the circular saw, this way achieving a straight cut. Alternative methods include fine-toothed jeweler saws for those who want to do the work by hand. The problem with these is that you almost never get a straight cut. Secondly, use a belt or a sanding wheel in order to do a basic shaping of a desired size. For a rapid material removal, use coarse grades - 80 to 160 grit. Last but not least, for a final touch use finer grades and work closer to tolerances. Sanding and filling processes can be done manually or automatically. We agree that manually-sanded and filled pieces are more interesting, but they involve a slower making process. Carvings are made using a Dremel-type tool, dental-type saws and burrs. Basically, after you shape the piece to the desired size, the surface is still rough from these processes, so the piece needs a final polish. This can be done using a cotton buffing wheel and also using the proper polishing compounds applied frequently for loading the wheel. Don't use strongly colored compounds, as this will affect the amber's surface. And don't forget to get a good grip of the stone, because the wheel's force can grab the amber from your hand and throw it all over the place. Because of this, small pieces are hard to handle, but those with insects inside are not to be ignored. So if you wish to work on smaller amber pieces, place double-sided Scotch tape on your fingertips, press the amber on it and be extremely cautious when working the piece down to 2-3 millimeters thickness. You can also use Dremel tools for drilling amber pieces. For example, you can use a twist drill for partial or total perforation of a piece before inserting a screw-eye or passing bead cords through the piece. Perfect alignment is required. As a tip, insert the drill a second time inside the piece, but only after moistening it in vegetable and mineral oils, to improve the perforation. When performing sanding and buffing on amber, remember that the piece might warm up to some degree, but this is harmless to the stone if the material is of good quality. You can work with “dry” pieces or apply water as a coolant on younger amber that may run on the sanding wheel. 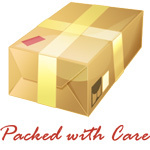 Let's move on to how to care for and polish Baltic Amber. 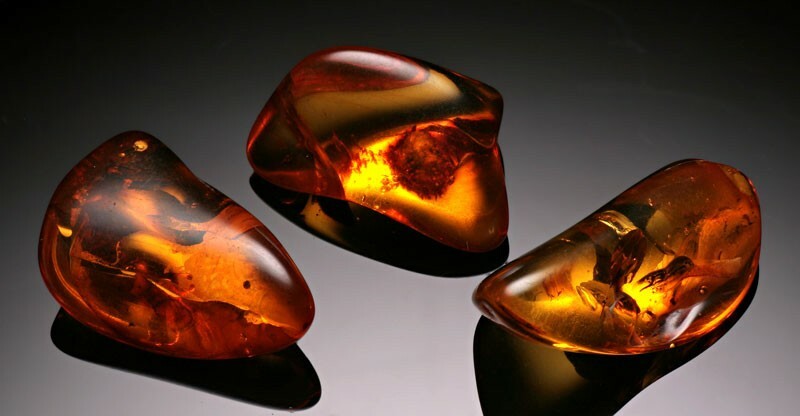 As you know, amber is an organic fossilized tree resin. The substance is not a mineral, so the stone is soft and can be easily scratched or damaged, with a value of 2 to 3 on the Mohs scale. But because of this, amber is also easy to polish in case of accidents. You should avoid dropping amber on ceramic or concrete floors, as it may result in breaking, chipping or shattering of the stone. However, if dropped on wooden or asphalt tile floors, there should be no major damages. Amber is also soluble in chemical-alcohols, chloroforms and acetone. 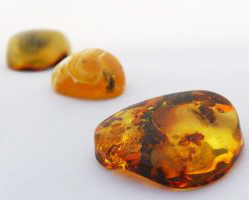 It is best to keep the amber stone in a soft-lined container and not expose it to air or direct sunlight for long periods of time. Long exposures may result in the evaporation of volatile substances found in amber's surface and in cracks after 2-3 years. For example, if exposed to strong UV light in laboratory conditions, a piece of amber is reduced to powder in one week. So keep it away from long sunlight exposures of any kind, and remember to apply silicone-based wax every 6 months to restore the stone's shine and reduce evaporation or oxidation. These are some of the ways to process and polish Baltic amber and it is important to know them if you wish to become more than an amber wearer. "Please mail us a picture of the stone and we will let you know whether it is amber." "Just found what I think is a chunk of Amber at the coast in Suffolk . Measures 2 inches by 1 1/2 . Any ideas "
"Hi Tommy, there are multiple ways to process your amber stone. The simplest way would be polishing it to uncovered colors and shades inside the stone. " "I found a large piece of amber and am interested in finding out what my options may be?" "Hi Kevin, please send us a picture of the item. Maybe we can help you. But in general the solution is polishing the ring in the right way." "Hi Jane, you probably just need to polish it in a rotary tumbler (drum) or with a buffing wheel. Amber should easily regain it's gloss." "I’ve got bleach on my amber ring and it’s lost all of its shine. Is there anything I can do? " "Industrial polisher would do the job in seconds. We can help you with this, please contact us." "My wife has an amber pendant that has a blemish from a jewler who tried to "polish" it. It still bugs her to this day. Is there a way to polish the blemish?"